Some spending cuts are needed. 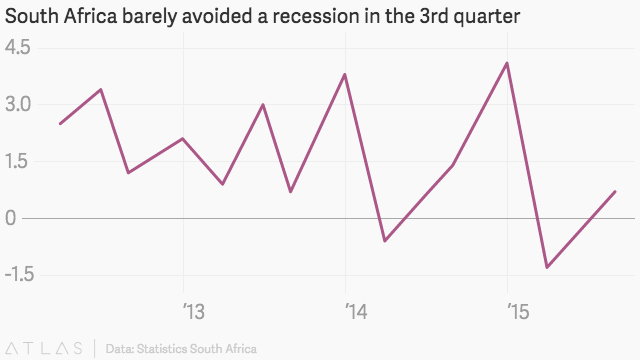 South Africa’s economy has been struggling for a while now. And things are just getting worse. Two of the three major credit ratings firms issued depressing indictments of the state of the country’s economy last week. Fitch cut South Africa’s credit rating to just above junk status while Standard and Poor’s (S&P) lowered its outlook from stable to negative. Weak economic growth, declining business confidence and ballooning government debt contributed to the latest rating, Fitch said in its note. S&P echoed those concerns and expressed a less than optimistic picture of whether the government can turn things around in the immediate future. “The country faces domestic constraints including an inadequate electricity supply and overall weak business confidence inhibiting substantial private sector investment,” it said. Africa’s second largest economy barely managed to avoid a recession in the third quarter, growing a measly 0.7% after contracting the previous two quarters. 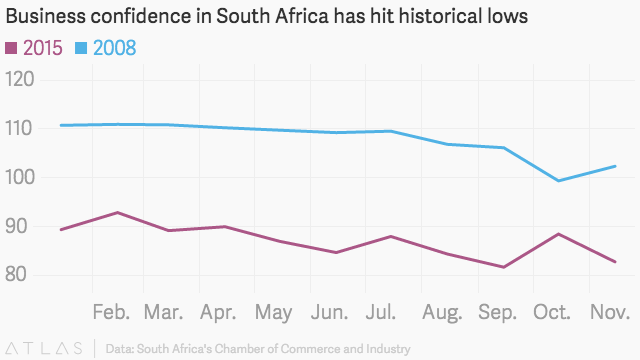 Meanwhile, business confidence continues to be low. In November, it registered a historically low figure reflecting an uncertain economic environment, the South Africa Chamber of Commerce, the body responsible for the rating, said in its report. And the outlook for the future remains bleak. Fitch has cut the country’s economic growth projection for this year from 2.1% to 1.4%. For 2016, they estimate GDP to grow only 1.7%, down from their initial forecast of 2.3%. In response, the government said it has instituted key reforms to help jumpstart its flagging economy, including infrastructure spending and restructuring of state-owned enterprises that eat up a lot of the country’s budget. With unemployment at a staggering 25% and the economy continuing to deteriorate, analysts anticipate that political considerations will outweigh any efforts to cut down on spending. This showed in the government’s 8% increase to salaries for civil servants after initially budgeting for a 6.6% jump in May. Public servant salaries constitute 39% of government spending. The rating downgrades are fueling fears of a potential rise in inflation and capital outflows, especially with the falling value of the rand and the possibility of the US Federal Reserve raising interest rates.